Ever since Brian DePalma almost silently dangled Tom Cruise above a pressure-sensitive floor in the first Mission: Impossible, each subsequent film in the series has come to be defined by its most exhilarating and audacious set-piece. Whilst the series has added a fair deal of comedy and something resembling emotional development for Ethan Hunt (Cruise) since coming under the eye of J.J. Abrams, who directed the third film and serves as a producer on Ghost Protocol, those are still little more than spice. The meat of these films lies in their ability to deliver breathless spectacle. It's no coincidence that Mission: Impossible II, directed by the once-brilliant John Woo, was both the weakest film in the series and the one with no single standout action sequence. Without those wow moments, these films are little more than lumps of exposition broken up by running. 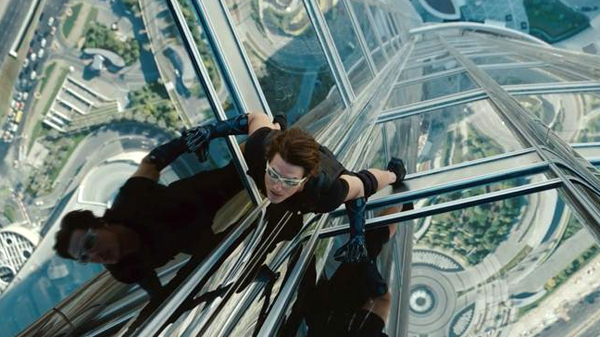 In that respect, Mission: Impossible - Ghost Protocol tops all previous entries in the series with its truly dizzying sequence set in, and more importantly on, Burj Khalifa in Dubai. For reasons that, in typical Mission: Impossible fashion, are too complicated yet completely irrelevant to go into, Hunt must climb up the side of the tower in order to access a computer server. He does this using what are essentially high-tech suction cups provided by his tech guy-turned-field agent Benji (a returning Simon Pegg) which repeatedly fail as he tries to make his way there and back again before their target arrives at the hotel. To say that the sequence is vertiginous is putting it mildly. Watching Hunt slowly work his way up the side of this gargantuan tower, constantly having to readjust his methodology to make up for the fact that his lifelines keep failing him, is really thrilling, especially because it plays out alongside the attempts of his team to set up an elaborate con that has to succeed or a madman (played by Michael Nyqvist) will use nuclear weapons to start a global conflict in the hopes that the surviving humans will rise up to become stronger. Did I mention that he's a madman? He totally is, albeit a pretty forgettable one, which is a major knock against the film in comparison to its predecessor, which had a phenomenal villain in Philip Seymour Hoffman. Nyqvist isn't bad in the role, but he does nothing to suggest that a million other actors could not have done the same job just as well, which is a weakness in the script more than the performance. Director Brad Bird (The Incredibles) brings a terrific kineticism and clarity to the sequence - and the film as a whole - using the cross-cutting to raise the stakes incrementally until it seems that things can't get any more insane, which they inevitably do because this is a Mission: Impossible film and they'd be nothing without plots that escalate to an insane degree. Even the Burj Khalifa sequence doesn't end with Hunt completing his objective, it just barrels along into a relentless series of fistfights and gunfights, culminating in a chase through a violently raging sandstorm. When Hunt eventually stops running, it feels less like he does so to catch his breath, than to let the audience have a few moments of peace after twenty minutes of delirious fun. The middle twenty minutes or so of Ghost Protocol may very well be some of the finest action direction of the last twenty years. It's such a frenzied sequence, delivered so well that it's hardly surprising that it overshadows the rest of the film. I for one found myself struggling to remember just why Hunt was climbing up the tower in the first place - he and his team are blamed for blowing up The Kremlin, though pretty much all the whys? in the film are far less important than the why nots? - and no matter what Bird and the writers do for the rest of the film, it just can't compete with watching Tom Cruise hold on for deal life at the top of the world. What's great about the film, though, is that they at least try to top it, rather than being content in the knowledge that they had nailed their key sequence. A third act fight in which Cruise and Nyqvist battle for control of a crucial briefcase on a series of moving platforms in a car park is exciting and wittily staged, but it's always in the shadow of Burf Khalifa. Mission: Impossible - Ghost Protocol is little more than empty spectacle, but it's brilliantly delivered empty spectacle. It feels like a film in which everyone involved was determined to do as much as possible to make it fun and they succeeded. It might not maintain the intensity of its best moments, but they're so good and the moments in between are such fun in their own right that it hardly matters.